NightStick prides itself on creating the safest lighting for the hazardous workplace. At facilities where flammable or explosive materials are common, electrical devices designed to be intrinsically safe can prevent the device from creating arcs, sparks, or heat that could ignite the explosive substance in the workplace. You'll see two great examples of NightStick's intrinsically safe lighting options here, both available with free shipping through September 11th. The NightStick LED Headlamp shown above is a great option for those who work in hazardous workplace environments and need the best in hands-free lighting. It's ideal use is for your head or hardhats, and it features five different lighting modes: spotlight, full-power white floodlight, half-power white floodlight, green floodlight, and dual-light. 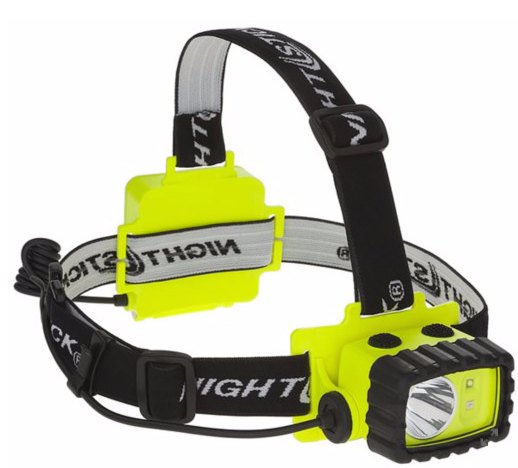 The options from this headlamp give you exact lighting for virtually any situation. The dual-light design means that any of the three floodlight modes can be activated simultaneously for even more lighting options. Learn more about the NightStick Intrinsically Safe LED Headlamp on our website. 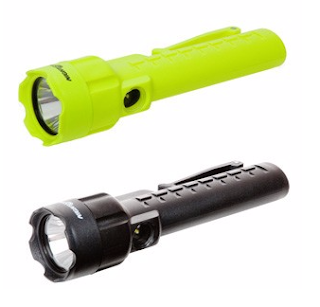 The NightStick Dual Floodlight and Flashlight is a tough and versatile light that's long-running, Cree-LED-driven, intrinsically safe, and meant for use in the most hazardous environments. The advanced 80 lumen Cree-LED and deep parabolic reflector produce a powerful, tightly focused flashlight beam designed to cut through smoke, dust, and significant distances. Separately, a floodlight shines from the underside of the light head, and the dual-light design lets you use both beams at the same time for maximum safety. Being waterproof and unbreakable help to make this the perfect choice for the safest handheld light. Learn more about this handheld flashlight on TheFireStore.com.